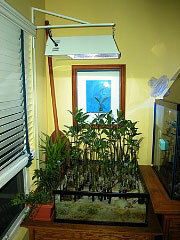 Red mangroves (Rhizophora mangle) are attractive and utilitarian additions to the natural marine aquarium system. A unique Atlantics biotope refugium has been created here for the display of Upside-down jellyfish with mangroves. Photo by Anthony Calfo. Mangroves have become increasingly familiar additions to marine displays and refugia. Yet despite their presence and improved availability in the hobby, they are still largely misunderstood and less than optimally kept. I have enjoyed keeping these uniquely coastal plants for many years in my own personal aquariums and have grown out several thousand specimens from seed in my greenhouse through the years. I hope to share some useful tips and observations here to help you succeed with one of the few, true marine plants for marine aquaria. 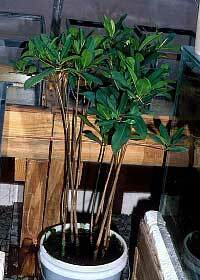 Let's first consider a bit of an overview on the plants called "mangroves." Much has been written about their enormous ecological importance in the tropical marine environment. They provide habitat for countless life forms above and below the surface and at the water's very edge. Birds, reptiles, mammals, fishes and invertebrates exploit mangrove communities for food, shelter and reproduction. The utilization of these communities as a nursery environment by larvae has extraordinary ramifications far up the web of life, on both sides of the shoreline. The very structure of these strategically tangled trees is crucial to coastlines for protection from erosion and in the stabilization of sediments from run-off that could otherwise pollute the offshore reef communities and subsequently affect the fish and invertebrates dependent upon them. The protection of mangrove habitats is crucial for the survival of coral reef ecosystems and economies, from the fisherman to the fished-for and so much more in between. The Black Mangrove (Aviccenia germinans) can be found coastally as a partial immerse or fully terrestrial resident. Although they are more tolerant of pruning (and cooler temperatures) than the Red Mangrove, their preference for decidedly less saline waters and a significant soil/mud component to their substrate makes them less attractive to marine aquarists. The White Mangrove (Laguncularia racemosa) does not tolerate full submersion in seawater very well, if at all, and really is best kept as a fully terrestrial plant. Aside from uncommon, but interesting, "land and sea" style biotope displays, the white mangrove has almost no appeal to aquarists. The key to healthy and vigorous growth in cultured Red Mangroves is the daily spraying of leaves with clean, fresh water to help the plant export salt crystals. Photo by Robert Fenner. Red mangroves occur in all saline gradients, but cannot typically move between salinities rapidly. When buying mangroves, it is very important to learn the salinity of the water from where the seedlings (propagules) sprouted, and insure the same at home. While propagules sprout roots and leaves readily in fresh-, brackish-, or full seawater just the same, they should not be moved quickly between them, but instead acclimated over a period of many weeks. You can imagine that the salinity of even nearshore environments is, by and large, quite stable by virtue of the volume of the sea. Mangroves do grow in a range of substrates from fine to coarse, but seem to strongly favor fine sand or muddy substrates. Be warned, though, their very elaborate and extensive root systems must be given due regard in the aquarium. Even a seedling mangrove can develop a formidable root system that can stress or damage glass or acrylic aquariums in as little as three years. Do not underestimate these roots by judging their modest leaf and branch growth above! I recommend mangroves be planted in containers that are as large as possible (removable pots), thereby reducing future disturbances of the tree without making it overly difficult to service for transplantation in the future. Rest assured, though, that growth overall is so slow and easily managed that these fascinating angiosperms can be enjoyed perhaps indefinitely in most aquarium systems. The wild collection of mangrove trees is forbidden in many areas, but the harvest of their abundant seeds (propagules) is fairly unrestricted. Un-sprouted propagules look like long green cigars with a narrowly tapered end from where leaves sprout, and a thickened, blunt, often brownish, end where the roots grow from. The propagule's larger end has evolved by design to increase the likelihood of it finding its way into a substrate when cast or carried adrift, provided it does not have the good fortune of finding itself plunged into the sand after a straight drop from the parent canopy. Un-sprouted seedlings may survive out of water in temperate conditions for up to a year. Aquarists are strongly advised to seek only un-sprouted seedlings. If any roots or leaves are evident upon arrival, you really must learn the salinity level in which the propagules were sprouted. Without such information, salinity shock is a very real concern and may be evidenced by a "desiccation" and demise within weeks as the propagule takes on a wrinkled appearance from the osmotic shock. Next, you must give serious thought to how and where to plant your mangroves. Some folks nestle them precariously in overflows or plant them in small refugiums. Others make a concerted effort to build an inline vessel or display around the young trees for a dramatic aesthetic impact and unique biotope display in its own right. The matter really boils down to a long-term veiw versus short-term one. Some folks do not plant the seedlings at all, but rather suspend them in mid-water ("Book of Coral Propagation, Vol. 1", pp 30-32) for the purpose of encouraging magnificent aerial prop roots. For aesthetic and utilitarian (biotope) purposes, the cultivation of arched prop roots on mangroves is very easy to finesse, despite the lack of tidal cycles in the aquarium. The placement of seedlings in overflows and small refugiums is a temporary solution at best. While they may grow slowly with limited stimulation of the roots, it is not ideal for long term keeping and vigor. Photo courtesy of Doug Wojtczak. 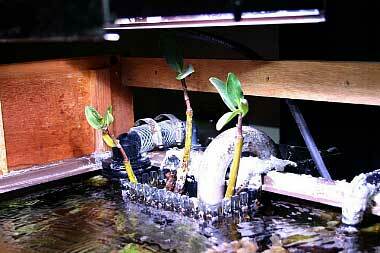 To encourage elaborate, aerial root systems, begin seedlings tied gently to a post (PVC pipe, rigid airline tubing, etc.) with flexible gardener's tape - available at a landscape or garden center. 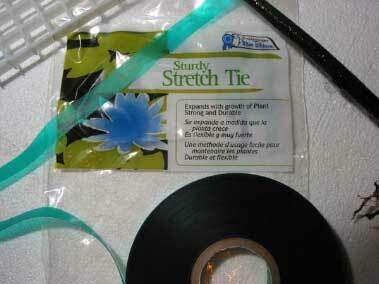 Be sure to use flexible tape, as rigid ties will cut into the plant as it grows. 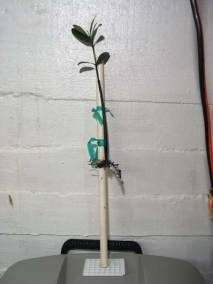 Immerse the tethered seedling to a depth where only the lower 1/3 of the propagule is submerged in water. Roots will sprout before leaves. As roots begin to grow and develop, you only need to gradually move the "body" of the plant upwards on the stake. In this teasing manner, strong roots will grow thickened and extensively to support the weight of the tree above the water as if the tide was going out. It will take many months before the propagule's body can be lifted completely out of the water with an arched and anchored root system, but what a magnificent and natural sight to see! If, instead, you choose to simply stick a propagule into a bed of sand like a dart, substrata root development will occur quickly and profusely, but aerial prop roots are unlikely, if possible at all, without a replication of tides and the exposure of some roots to air over time. 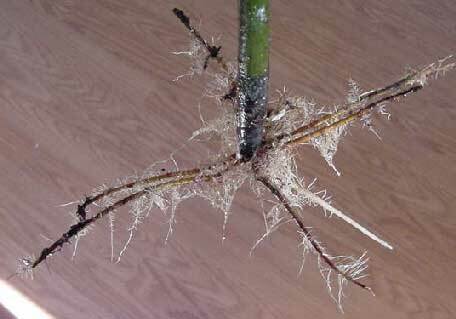 Attractive aerial prop roots can be encouraged without simulating intertidal cycles by gently tying your mangrove to a stake with soft, flexible gardener's tape. Over time, gradually raise the barely immersed roots further and further out of the water for them to form handsomely. Photos by Anthony Calfo. Fertilizing the substrate may be helpful in new or dry sand beds, but unnecessary or dangerous in aged aquariums where levels of dissolved organics are typically high. One notable exception may be magnesium as mangroves have been implicated as a measurable draw on the element. Of course, so many other things in a thriving reef aquarium are also a burden to magnesium levels, which may require being supplemented, so don't let that stop you from keeping mangroves! Mangroves will not develop exaggerated aerial prop roots unless they are suspended or exposed at times to simulate intertidal exposure. Nonetheless, planted directly in the sand or mud, they develop strong root systems fast. Photo by Kevin Pockell. Regular partial water changes, however, may be the simplest means to improve overall water quality and support vigorous mangrove growth. 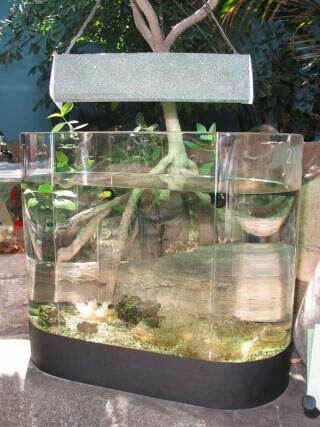 If protein skimming is not your principal means of nutrient export beyond water changes, a mangrove feature (refugium, sump, in-line vessel) should be fed raw overflow water from the display to give them the opportunity to utilize dissolved and particulate matter. It would be both counter-intuitive and counter-productive to feed mangroves clean, filtered water, given their natural habitat and needs. Photo courtesy of Margarita Man. For all my love for keeping these plants, however, I must admit that they truly are not comparatively efficient nutrient export mechanisms. It's a very simple matter. Growth overall is slow, and leaf drop is often concurrent with new leaf growth. The net gain of mass from these plants is, in fact, dismally slow, and leaf drop alone (as a vehicle for nutrient export) cannot compare to a vigorous Chaetomorpha or Gracilaria based vegetable filter. Lighting is a simple matter with mangroves. They are quite adaptable to a wide range of light but prefer bright illumination. Expensive reef aquarium fixtures are not necessary. Common warm, daylight-spectrum bulbs from the local hardware or DIY garden center store work very well. Many aquarists have grown fine mangroves under incandescent (including mercury vapor and metal halide) plant-growth spectrum floodlights or spotlights. More than lighting, though, regular spraying of the healthy leaves with freshwater is a bigger influence on plant vigor and growth. On humid and often rainy coastal shores, it's no trouble for these plants to purge the daily influx of salt. But in dry homes without "rain" (spraying of the leaves), mangroves suffer noticeably in short while! taking three or more years to even get 2-3 feet tall. If you must trim your tree, be sure to delay any pruning until after the axial tip has branched. Damage to the growing tip before it has split can be fatal to young specimens. or Upside down jellyfish littering the sandy floor of a special display. Look deeper into coastal habitats and niches and you may find many, truly unique and rewarding new ways to enjoy your hobby with mangroves!